If you want to pay a visit to our pottery, clickk on the right button" ZOOM +". After passing the rocade Ouest ,you take the D632 in direction of Plaisance-du-Touch. Approximately 8 km from Lombez you drive on the D632 in direction of Boulogne-sur-Gesse. In Boulogne-sur-Gesse follow the direction Tarbes . When leaving Boulogne-sur Gesse follow our indication signpost La Poterie ,that will lead you to us . After approx. 4 km of Auch, you turn left on the D929 in direction of Lannemezan. Follow the D929 to Castelnau-Magnoac. 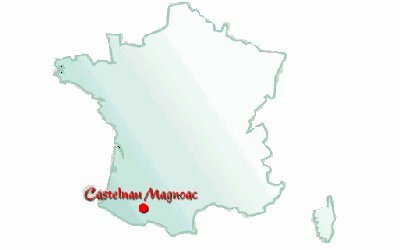 In Castelnau-Magnoac you turn left on the D632 in direction of Boulogne-sur Gesse. You pass Thermes Magnoac, after 1 km at the intersection you'll see our indication signpost La Poterie, that you lead to us. Your way to "La Poterie".